After a long time finally again a typical Bunna from the Sherrytonne: banana, port flavor, dry sherry. Memories of the Sgeul Na Mara (Feis Ile 2013 Bottling) awake. Rather no water. Pure: again very different than the Glenlivet. Again, a sherry board, but this time with a buttery, creamy note. Black Forest Cherry Cake could be said. Amaretto. 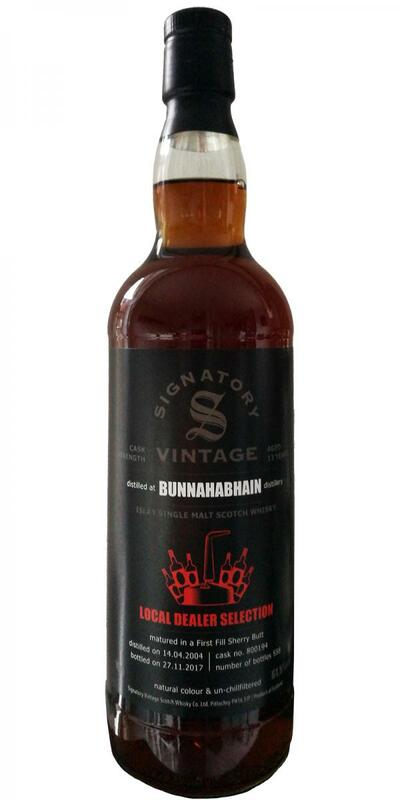 And after a long search under zig bottlings finally again the slightly dirty, Bunnatypische banana note. Where have you been so long? This brackish water to diesel tanker as it should be. With water: herbs, dark orange come out. Pure: how cool, here again the bunna sherry character, slightly nutty, buttery, overripe banana and some fish net here. That's the way it has to be. With water it becomes drier, nuttier, better without. This is a board - with everything I like. Unfortunately, the alcohol is a bit too stormy and water is not good. That gives point deduction. The finish is phenomenal. 87 points. Nutty, dry fruit pounding in the nose. Intense sherry rushes forward. Alcohol is also there. Immediately there is some sulfur in the background, just so that you perceive it and that it is a bit more interesting. Prunes with pepper. Blood orange, pastries and some leather. A spice is included, which is difficult to grasp at first. Some soy maybe. I perceive roast aromas. Roasted and already somewhat blackened almonds. Then suddenly it will be unexpectedly sweet - and how. Shortly I have trolli gummy bears in my nose. But they go back quickly. Hand warming lures out first some alcohol, but then it is sweeter again and cherry is added. Water: The whisky is a bit tamer. Nut biscuits come through more clearly, a little cinnamon joins. Tingling, the mouth is filled. Sherry. Cherry is at the forefront. There are also slightly nutty and spicy hints. Sweetness is there, but severe dryness soon takes over. Plums and orange peel mix with toasted aromas. Spicy oak is fighting through. In the Nachschmecken comes something easily Vergorenes, which I like very much. The bitterness begins. Water: Sweeter and a little fresher, but also a little sharper (alcoholic). The 60 +% are better integrated. Long, sweet at first, then gradually yielding to increasing bitterness. In the end it is more noble chocolate, 80% + cocoa content. The glass is coming to an end and the bitterness takes over everything. It sticks forever in the mouth. Bunna is recognizable, but not very clear. Since a lot of Destilleriecharakter is covered by sherry keg. Not a bad whisky, but somehow one wishes to experience the time without this barrel sweetness. Undiluted you can feel the alcohol in the nose. He transports relatively few flavors. With a good swing of water gives the alcohol note, the whisky is soft and caramel. Milk chocolate and espresso beans show up. Sweet raisins and dried figs. Some muff and loamy soil. Undiluted, he starts as expected strong and aggressive. A little alcohol, with sweetness of raisins and dried apricots. Freshly tanned leather, furniture polish. Chocolate, espresso beans, herbs, spices (not differentiable). Short to medium, with chocolate, almonds and raisins. A great color shimmers in the glass. Dark, deep sherry aromas, tobacco, dry wood in front of the fireplace, espresso, roasted nuts and kernels, roasted aromas, caramelized sugar, an elegant fragrance note resonates and accompanies the aromas. Dates, dark chocolate, Marsala, the alcohol is barely noticeable and the roasted aromas become more intense over time. With water it becomes sweeter and underlines the vanilla and it reminds me more and more of Marsala and even eggnog. Very nice texture with an interplay of dry and creamy, sweet-tingling with a precisely timed pepperiness that subsides at the right moment. Hot chestnut, fresh hazelnuts and walnuts, espresso, chocolate, chocolate-covered caramel, forest honey at the end. With water it is softer and the pepper is defused, the forest honey becomes more present and the tobacco becomes fresher like a freshly opened tobacco pack. At the end of the oak comes out clearly and the finish stays longer.